After going 7 months without a reported human H5N1 case in Egypt, for the second time in a week (see last Tuesday's case in Sohag) the FAO is reporting a confirmed case, this time in Cairo (h/t Biological100 at FluTrackers). The Egyptian MOH website has yet to acknowledge either of these cases, and may not, as their MOH stopped routine reporting of cases more than a year ago (see Regarding The Silence Of The Egyptian MOH). 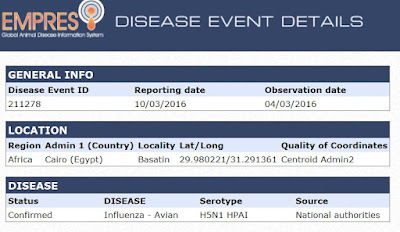 Today, via a brief report delivered through the FAO/EMPRES portal, we get what appears to be confirmation of the second H5N1 case of 2016 in Egypt. 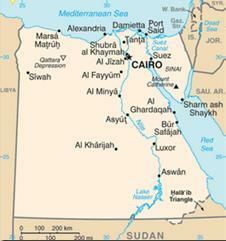 Other than the location (Cairo), and the observation date (March 3rd), few details are available.